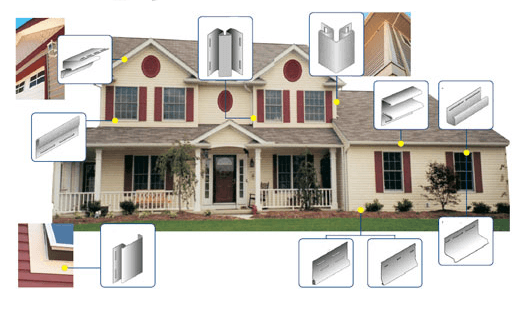 3 Steps to Calculating your Siding project materials and accessories. Every time your house wall changes direction, there is a new wall section as shown at right. Mark down the dimensions of all the square and rectangular sections of your house in inches to determine the total area to be covered. Select the appropriate wall sides in the 'Left Side' and 'Right Side' boxes following these rules: Outside corner, Inside corner, Edge corner. Measure your walls and enter the height and base widths of each wall in the entry form. Mark the 'Left Side' and 'Right Side' boxes with the appropriate selctions. Leave blank if you do not want to include these calculations. Measure all doors and windows, as well as any other areas that will not need to be covered with siding. Mark down the dimensions of all the square and rectangular sections of your house in inches to determine the total area to be left uncovered. These amounts will be subtracted from the total siding requirements. Measure the height and width of each door, window and any other rectangular parts other than walls that will NOT be covered. ** These totals will be SUBTRACTED from the total suface area when calculating the amount of siding needed to complete your job. Using the image shown at right as a guide, mark down the dimensions of all the triangular sections of your house in inches to determine the total area to be covered. These measurements will be combined with the total wall areas to determine the total surface area to be covered. Measure your Gables by measuring the heights and base widths of your home's gables and other triangular parts and enter these dimensions in the entry form provided for each triangular area. 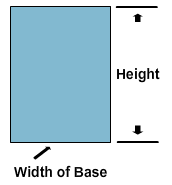 ** Height should be measured from the highest point of the triangular area. Based on the measurements you have entered in the different sections of this guide, your siding and accessories requirements have been calculated below. Print this page, or the complete printable page detail and present it to your nearest siding retailer where ever ABTCO Siding products are sold. 1 square = 100 sq. ft.